This Friday we're launching the fresh crop Guatemalan coffees from Finca Vista Hermosa and El Diamante. Both will be available in our webshop and our coffee shops. In March our director Peter Dupont and bar manager and 2013 Danish Barista Champion Rasmus Gamrath visited the farms in the region of Huehuetanango. Here are their reports from the trip in two parts. The first week of March 2013 I (Peter Dupont) travelled with our good friend and wholesale costumer Martin Herlak from Aroma from the city of Herning as well as Danish barista champion Rasmus Gamrath to Guatemala. We left Denmark early Saturday morning. Arrived in Guatemala City at night and met with Edwin Martinez from Finca Vista Hermosa. With him was Drew from Onyx, Wille from Heart Roasters in Portland, USA and his friend Shelby. Sunday we drove to Huehuetenango and Monday to El Diamante to visit Patricía Perez who we bought a very speciel Guatemalan coffee from last year. It was a great pleasure returning to visit her. She’s very hospitable and immediately invited us in for freshly baked bread and their coffee "Essencia". It’s such a nice little mill, patio and house they have. Rather simple but kept very charming and very clean. 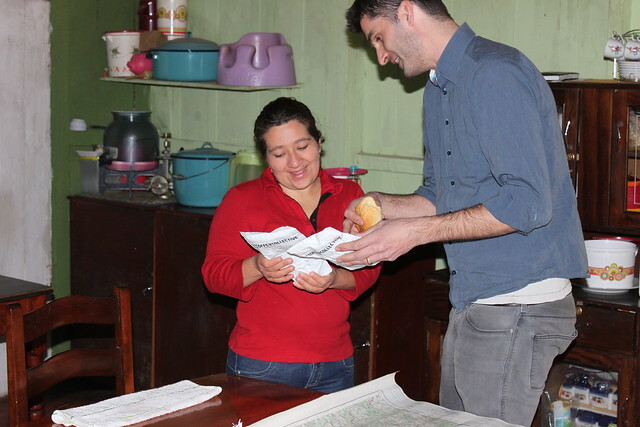 I had a few bags of our roast of El Diamante with me to give Patricía and show how we roast and present her coffee. Our label text is in Danish so I translated it to her. It was great to show her this and tell her that we very much liked her coffee and that we had many costumers who also value it very highly. When I told her that we had no more of her coffee in stock she laughed and said that then we had come to the right place. The coffee we had last time from El Diamante had a flavour profile and especially an acidity that reminded me a bit of a gentle top Kenyan coffee. When visiting the mill again I was curious to see how much of this flavour might stem from their way of fermenting. So I tried to understand this in to more details. It turned out that they ferment up to 40 hours and after washing they do an overnight soaking around 12 hours (and even longer at sometimes) where the washed parchment is well covered with water. This seems not unlike what they do in Kenya and is at least not very typical for what I have seen in Guatemala. I wonder about the fermentation processes during this soaking. I guess the temperature will still be around 15-20 C (at El Diamante they have a pond lying few meters above the mill from where they get their water. It is my impression that the water will be sitting here long enough to be at least 15-20 C). At this temperature fermentation will still be going on. The anaerobe environment when the parchment is covered with water also shouldn't stop fermentation. It would be interesting to know more about soaking influence on the flavour profile. The next day we went to Finca Vista Hermosa. Here Drew was doing a great job on test roasting lots of samples for us to cup. We had the chance Wednesday to cup the samples we brought from El Diamante and to be honest - we where a bit disappointed. The beautiful fruitiness was tipped over towards over-fermentation. This was really sad to cup since we really enjoyed the coffee last year and even more we enjoy working with Patricia. Drew agreed to do a re-roast of the samples and we cupped it again the day after. Luckily the different roast seemed to have tipped the coffee back on the right track but the experience from the first cupping still stuck a bit with me. Therefore we got more samples sent home and later when we where back in Denmark we roasted these samples again and here we had no trace of over-fermentation. 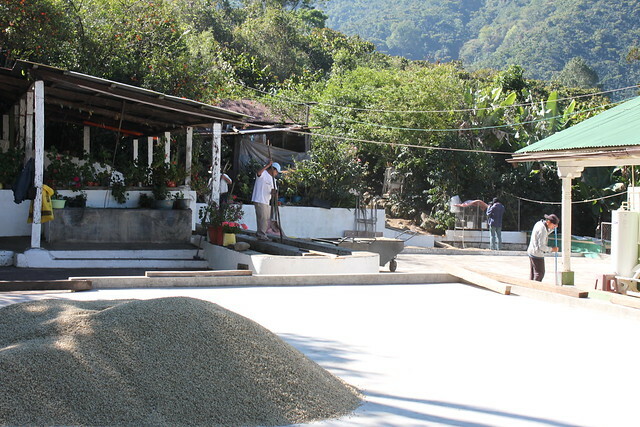 The new crop El Diamante was again a beautiful fruity cup but entirely on the clean side. I must admit that I havn't been fully aware of how much the roast can do in tipping a fruity coffee like this from one side to another on the border between fruitiness and over-fermentation. It’s of course a bit scary but on the other hand I feel comfortable that we in our production roasts can find the profiles that will bring out the best fruitiness in this coffee without any over-fermented tones. You can see all our pictures from the trip in this Flickr set.